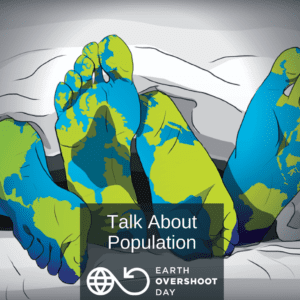 Tomorrow will mark Earth Overshoot Day, the day that worldwide humanity will, in only seven months, have taken more resources from the Earth than can be replenished within a single year. During a calendar year, the globe’s 7.6 billion residents consume through overfishing and overharvesting forests more than Earth can replace and emit more carbon dioxide into the atmosphere than ecosystems can absorb, about 1.7 Earth equivalents as measured in natural resources. With 328 million people, the United States ranks third behind China and its 1.4 billion people and India with 1.2 billion in total population. Within seven years, India’s inhabitants will exceed China’s. Nigeria, currently the world’s seventh largest country, is growing the most rapidly and is expected to surpass the U.S. by 2050. The United Nations Department of Economic and Social Affairs projects that the unsustainable global population will reach, unless immediate behavioral changes to slow the current growth pattern occur, 9.8 billion in 2050, and 11.2 billion in 2100. But the challenges that Overshoot Day highlights are daunting. The group of 47 least developed countries (LDCs) has a high fertility level, 4.3 births per woman in the 2010 to 2015 period. As a result, the populations of those 47 countries have grown rapidly, 2.4 percent. Although some slowing is anticipated over the coming decades, the combined population of the LDCs, roughly one billion in 2017, is projected to increase by 33 percent between 2017 and 2030, and to reach 1.9 billion persons in 2050. Africa will also experience high population growth rates. Between 2017 and 2050, 26 African countries are expected to double their populations. Most Americans will be surprised to learn that the U.S. is on the list of nine countries that will generate half the world’s population growth between today and 2050. The other eight include India, Nigeria, the Democratic Republic of the Congo, Pakistan, Ethiopia, the United Republic of Tanzania, Uganda and Indonesia. But as the Earth Overshoot Day website notes, “The past does not necessarily determine our future.” With cautionary optimism, the site offers attainable solutions to reverse the devastating course the world has taken. Among the suggestions are to reduce carbon footprint and to build and inhabit compact cities that offer energy-efficient buildings, integrated zoning and effective public transportation systems. Also suggested is to more efficiently produce food with an objective to waste less of it – some plant-based foods use fewer natural resources in the development process than animal-based. Because personal transportation makes up 14 percent of humanity’s carbon footprint, fewer cars on the road is an essential first step to lowering the human impact. These lifestyle changes require a firm commitment to having smaller families, or no families. Reducing family size by an average of one half child – or one child per every two families – would mean one billion fewer world residents in 2050 than the UN’s predicted 9.7 billion, and four billion fewer than the anticipated 11.2 billion expected when the next century dawns. Many children born in 2018 will have a high probability of living until 2100, and should have the opportunity to inhabit a less densely populated planet. The U.S. can lead in the effort toward worldwide sustainability. But, disappointingly Congress has for decades neglected its responsibility to support meaningful advances in ecological preservation. To repeat, however, “The past does not necessarily determine our future.” But now is the hour for dramatic lifestyle changes, some perhaps personally inconvenient, if the world can realistically expect to see a sustainable future for the planet, its people and all other species. This entry was posted in Environment, Environmental Issues, Population Impact. Bookmark the permalink.